Get your Spring Cleaning done faster with these tips. 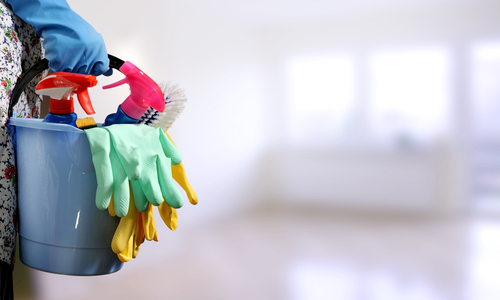 Spring is almost over, and you haven’t started spring cleaning yet. We get it. It is difficult with the busy schedule you have. Spring is the perfect time for renters to finally do deep cleaning tasks and seasonal tenant maintenance. Here are some tips to help you finish right away. Start with walls, cabinets, baseboards and woodwork – Start with the big stuff. This will help get them out of the way as early as possible.Give your walls a bath by using a sponge, water, and detergent. You should do the same for surfaces. For higher spots, use a sponge mop. Lastly, dry it all with a clean cloth. Give your windows a bath – hopefully, your windows are pretty clean at this point. If it is, then the only thing you need to clean are the window screens and sills. Make sure to remove dirt, cobwebs, and insects. Use the vacuum cleaner smartly – Instead of dragging every piece of furniture off the carpet, just move the big items a little to the side then vacuum the area that was previously occupied by the furniture. After that, move the furniture back into place. Less effort, more efficient. Clean your carpets – Naturally, your carpets will need to be cleaned too. You can hire a local cleaning company this one, or have a friend help you out. Pay attention to your floors – protect your floors by applying a combination of wash and wax floor cleaner. This will help keep your floors looking fresher. It will also add a protective layer to help them last longer. Got more tips for your fellow renter? Share them in the comment section below.